Note:- Bold numbers in the grey boxes are the scale for the estimated rating level for this race. The position of the horse's name indicates the expected performance level as assessed before the race. The table can be read from left to right as the expected finishing positions of the runners. In the profile written for Folio's debut race at Leicester the record of his trainer Barry Hills with debuting useful 2yos in early June was noted. The obvious question was whether he was one of them and would he win FTO as the best types tend to do at this time of the season. He did not win but ran a satisfactory race in finishing second having lost two lengths at the start and making an effort to get through to second approaching the final furlong. He was repelled by a Kevin Ryan ahead-of-schedule 'special' who very fit and already had a the experience of a run. However, in paddock review he didn't look a useful 2yo and just an average maiden winner and that race ordinary. His trainer then ran three moderate ones soon afterwards who failed to place. This, in the period when we should expect some of his best? Was he short of useful 2yos? Well, good trainers usually have good strategies and plans which they stick to, it is part of what makes them 'good' and why analysing what they do can be useful. The last four debuts from 9th June to yesterday (about 7-10 days behind his normal period) have been - Cumin (2nd at 11/2 and clear of the field), Thousand Words (1st at 6/1 with market support), Special Day (1st as 7/4f) & Roclette (unplaced as favourite having given the field a 10 length start with a slow break). Of those four Cumin is at least useful, Thousand Words is the better owner bred type (over 7f) for Khalid Abdulla that Folio looked short of, Special Day looked less good and probably just over average in quality terms. Having not seen the expensively purchased Roclette at Leicester and given that she used her effort to get past midfield the jury is still considring things. It is interesting to note that we have seen a number of debut wins by better types in the same period which have taken away some of the feeling of a lacklustre season to date. If we go back to Folio then try looking at this picture and see what you think of him - picture. In review there he was below average size but lacking some build behind although a neat, ready 2yo type but with limited scope. He was on the 'possible to oppose' list if he got into a tough race. He would probably be at an unrealistally short price because of his connections and the "2" next to his name but he's avearge and beatable. 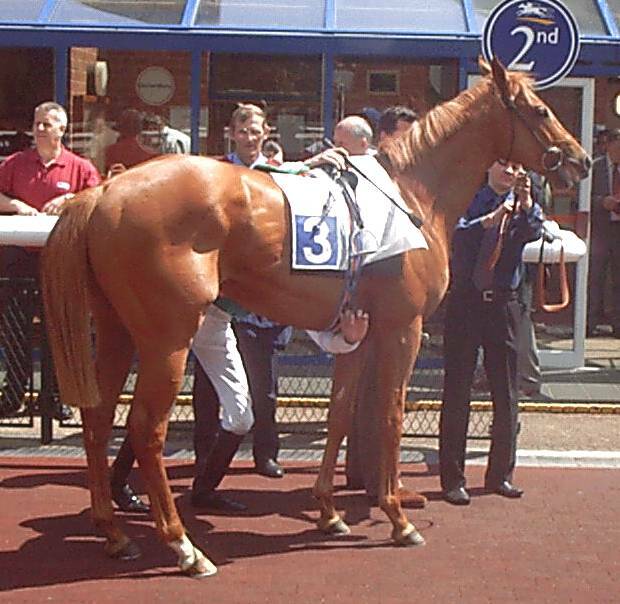 But here he is at York and on profile it is a soft race and he isn't really opposable. For example Alderney beat three runners with better form than Folio has when making her taking debut at the course yesterday. But Folio seems to have dodged that along with runners with solid form (and they are both Class 4 races to make another point). So, unless there is something a little special lurking he ought to be able to win by being average. Ela Elaka Mou represent Michael Jarvis who had the debut winner for Sheikh Mohammed with Alderney yesterday. He is a trainer who gets FTO winners regularly but usually they are for the Maktoum family in some form. This filly isn't and while she might be alright she's unlikely to be another 'Alderney' (or the market should tell us if she's been working with her). Aviva represents Howard Johnson & Graham Wylie and after a moderate 2005 lightened only by some early season success with Masta Plasta and Pacific Pride this season has not not got going for them. Given the money they have thrown at it they ought to be getting better horses. The two winners they have had so far were not sales purchases. Aviva looked pricey at 60,000gns and because the trainer winds them up before debut they will compete strongly if they have good ability. The 'winding up' also sees tham going over-the-top early as well as the two good horses named above did in 2005. If you have a spare moment try looking at Domino Dancer's record in 2006. He's the only runner who finished in the first six in a Newcastle maiden who has not won since and has run his worst race since. Is there any pattern here? It is difficult to work up too much enthusiasm for the others today but always worth reminding ourselves that Folio isn't a firebreathing dragon. Looking at Oscarshall's sales picture he looks a likeable, atletic type with some potential. If he has some ability he would be well bough at €37,000. However, unlike Mr Hills his trainer's record leaves B2yoR a little baffled, the strategy isn't obvious. His overall record is mixed and variable from year to year. Overall he doesn't seem overly bothered with 2yo racing and sees it as a development for the horses' older careers. He has just started running his 2yos this season and normally rarely gets placed runner on debut. None of his handful of placed debuts in the last three seasons have won during the season and to some extent were an indication of a duff race. He has already had two placed runners in the two days - Novista & Gentlemen Pirate. Were they the same indicator or is one of them ok? Are they a sign that he has a better set of 2yos again after a solid 2005? If so we can expect a 10%+ strike rate from a lowish total of runs and runners to watch for after debut. Worth noting that at least two of the other debuts have lost ground at the start and looked a little clueless (including here yesterday). Oscarshall has a 7f+ pedigree so that a bumbling debut here wouldn't be a surprise but he is probably worth tracking.